The Columbia River creates most of the border between the states of Oregon and Washingon. Nestled at the tip of the peninsula that juts from Oregon’s northern corner is Fort Stevens State Park, home of Fort Stevens, an Army base constructed near the end of the Civil War. The fort is the only location of an attack on a mainland U.S. military installation by the Axis powers. 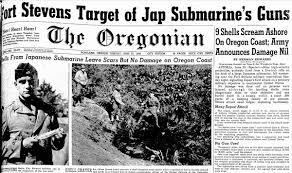 On June 21, 1942, in order to avoid minefields, the Japanese submarine I-25 followed Allied fishing boats to the mouth of the Columbia River. Commanded by Tagami Meiji the vessel held ninety seven crew members. Their mission? To destroy enemy ships and to engage the enemy on land with the sub’s deck guns. 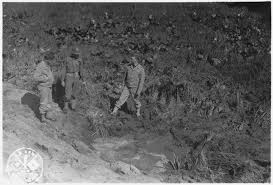 That night, under cover of darkness, I-25 surfaced and fired seventeen shells at Fort Stevens whose commander ordered an immediate blackout and refused to let his men return fire in an effort to prevent the sub from ascertaining the fort’s exact location. His plan worked. Most of the shells landed in a nearby baseball field, damaging the backstop and nicking some of the surrounding power lines. American aircraft on a training mission spotted the I-25 and called in an A-29 Hudson bomber to attack. The A-29 zeroed in on the I-25 and dropped several bombs, but the submarine was able to submerge unscathed. No lives were lost, but the incident created concern of an imminent invasion, and barbed wire was strung from Point Adams southward. 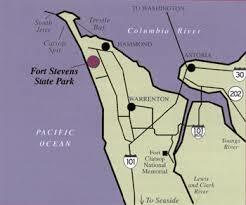 Fort Stevens was deactivated after the war, and became a state park in 1975.